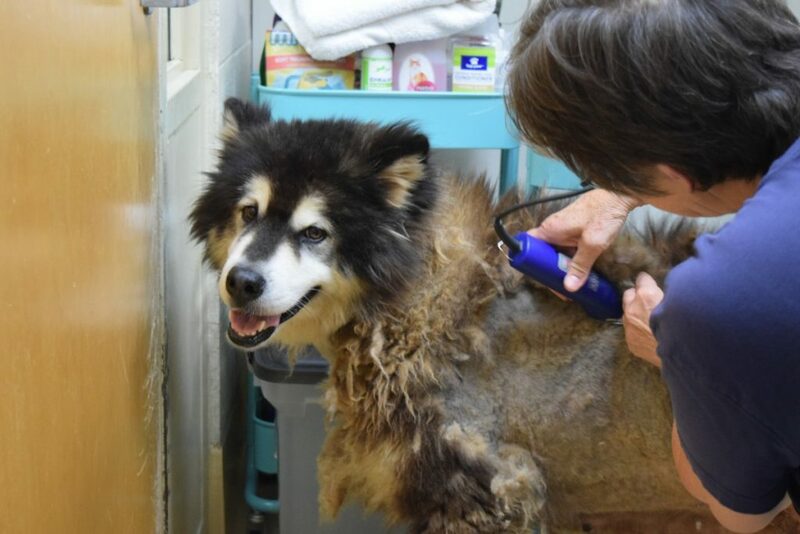 Dog rescued from dog meat farm in South Korea undergoes transformation thanks to OHS volunteer groomers. 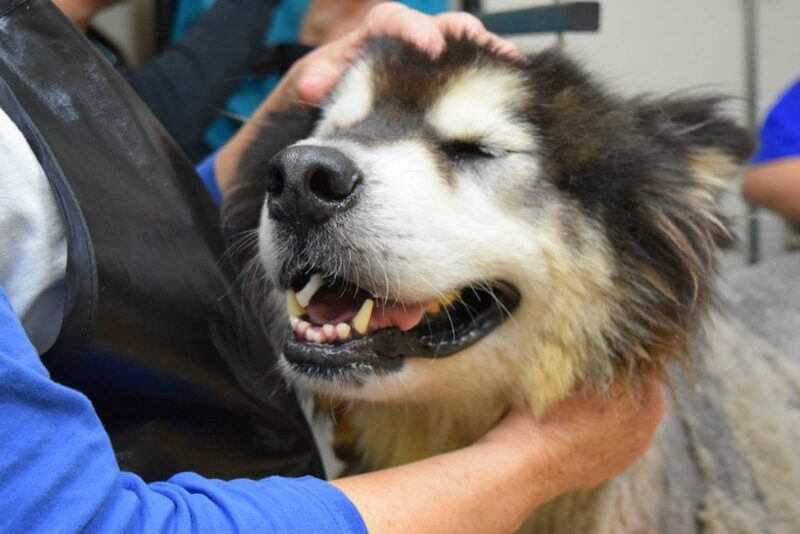 When Yogi emerged from the flight after the long trip from South Korea, her joyful disposition was immediately evident. 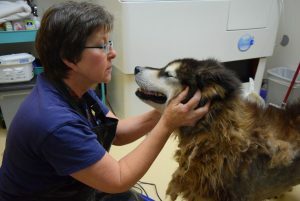 She was eager to greet everyone and seemed to convey gratitude for the opportunity to be free from the cruel life she endured on a dog meat farm more than 5,000 miles away. 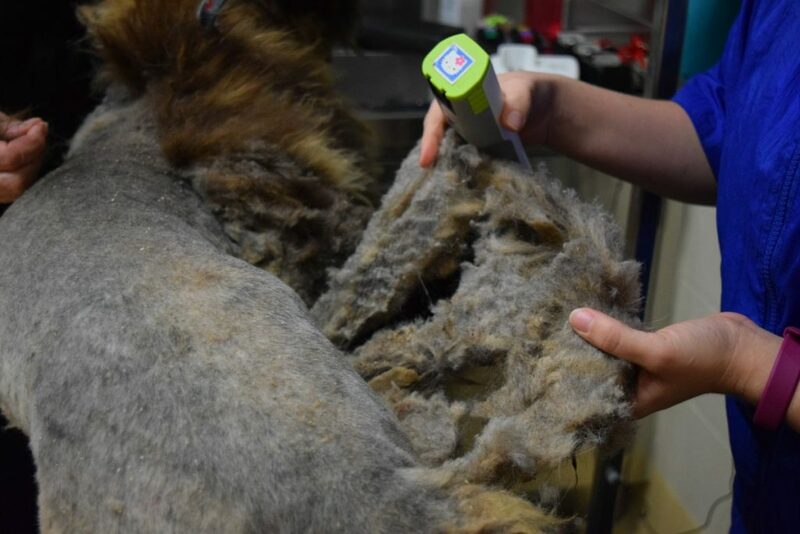 Unfortunately, the years of neglect and living in filth were also evident in her extremely matted, foul-smelling coat. 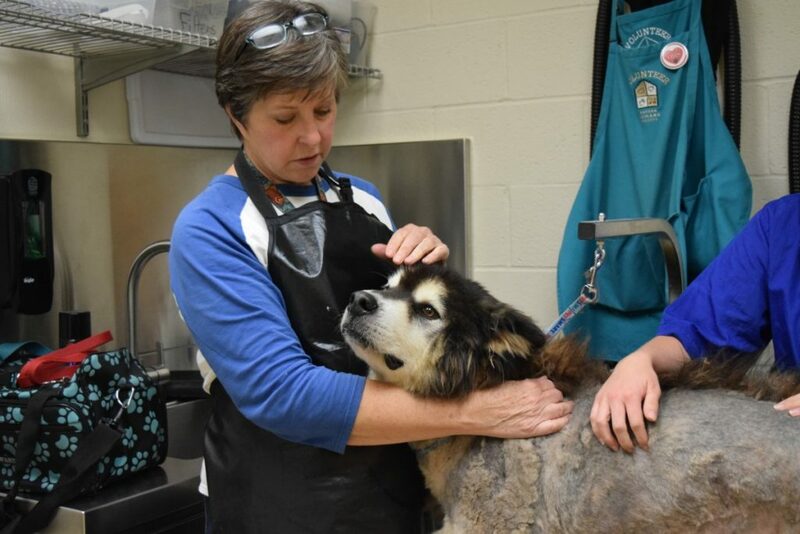 Yogi arrived at OHS and instantly became a favorite among the staff and volunteers who were caring for her. She seemed to be quickly adjusting to her new space and was always ready for human attention. 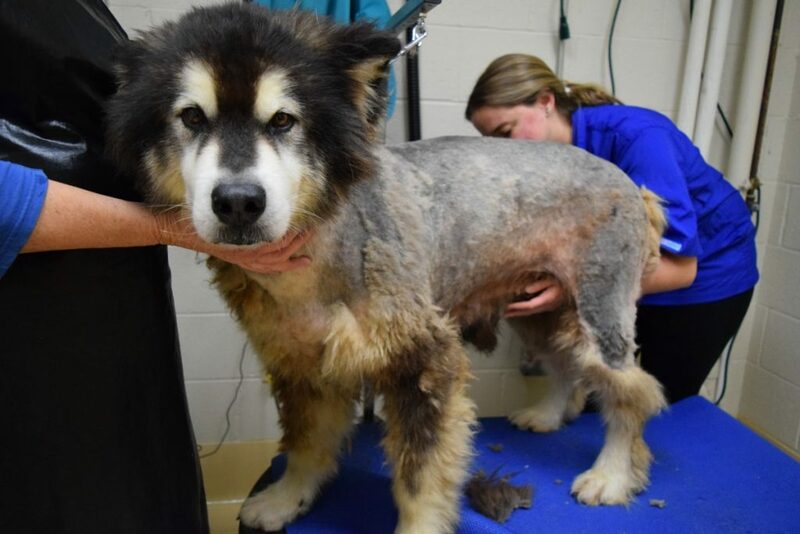 A close look at Yogi’s coat was horrifying and heartbreaking. The tight, thick mats were likely causing Yogi a lot of discomfort. 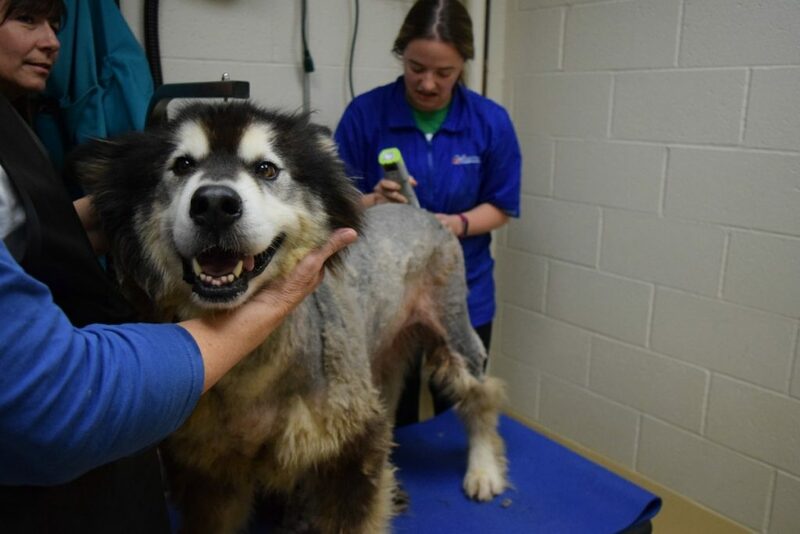 Volunteer groomers Krystal Ragsdale and Deb Morgan were up to the task and Yogi seemed to relish the attention, patiently tolerating the buzz and vibration of the clippers. As the mats were peeled away, Yogi’s body appeared. “Air hasn’t touched this skin for a long time,” Krystal explained. “This causes it to be very dry and flaky.” Yogi’s skin also twitched as Deb and Krystal touched her – another sign that this was a new sensation. 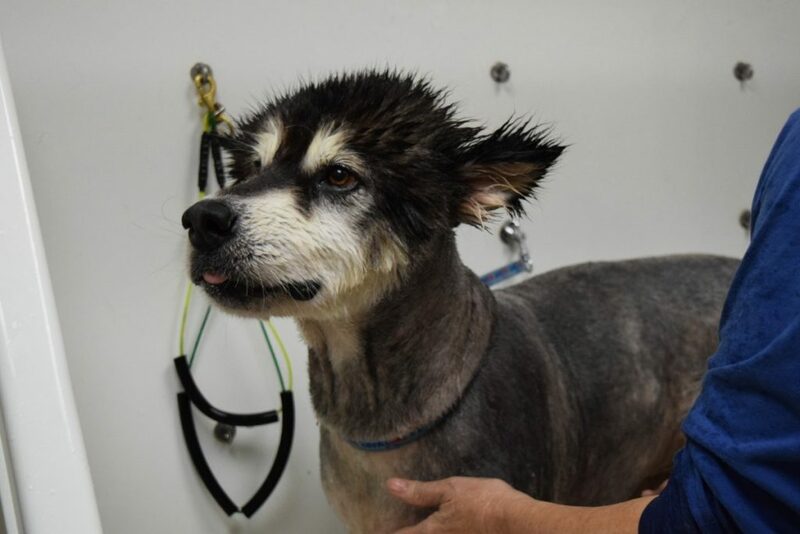 Yogi’s last stop in her makeover was a bath and again she complied – waiting patiently as Deb and Krystal shampooed and rinsed. 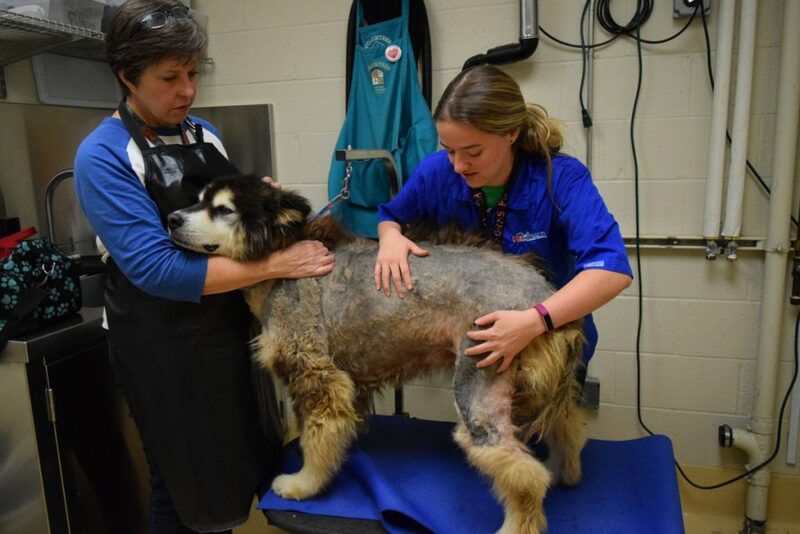 When Yogi emerged from the tub, she marched passed the mountain of hair that carried the weight of her cruel past. Deb walked Yogi outside where she could feel the cool Oregon breeze on her body before returning to her spacious kennel for dinner. “She must feel a million time better,” smiled Deb. See Yogi’s transformation in the video below. Deb got through about 1/3 of Yogi’s coat on the first day of work. 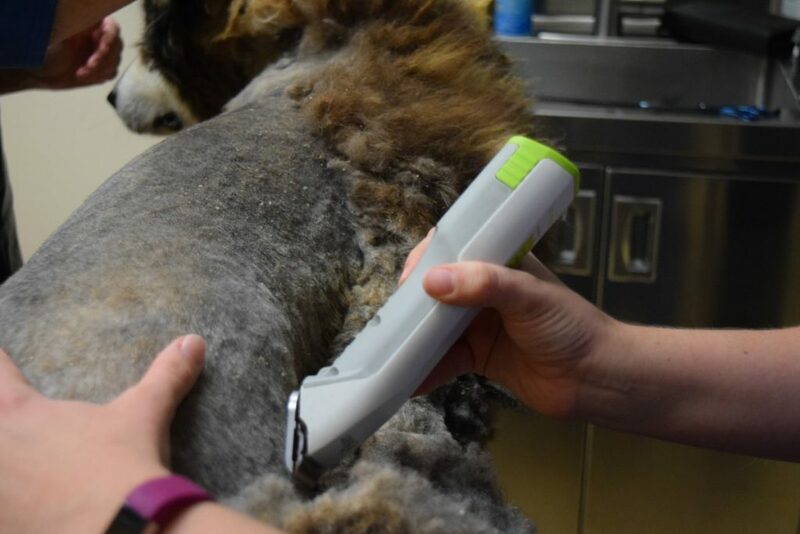 Yogi was so patient as she was shaved. The mats came off Yogi’s body in large sheets. Krystal diligently worked to free Yogi from her mats. Yogi’s dry flaky skin was the result of mats and filth covering her body. Deb calmly reassured Yogi during the entire grooming session.